A two Judge Bench of Supreme Court on Monday upheld the appointments of of Mr. K.V. Chaudhary as the Central Vigilance Commissioner and Mr. T.M. Bhasin. "We find no ground to quash the appointments", said the bench. The verdict was delivered on two PILs, by the NGO Common Cause and others and by the Centre for Integrity, Governance and Training in Vigilance Administration respectively, challenging the appointment of Mr. K.V. Chaudhary as the Central Vigilance Commissioner and Mr. T.M. Bhasin as the Vigilance Commissioner in June, 2015. The main ground urged to quash the appointment was that it is illegal and void, there being a violation of the principles of ‘impeccable integrity’ and ‘institutional integrity’ as laid down in Vineet Narain & Ors. v. Union of India & Anr. [(1998) 1 SCC 226] and Centre for PIL & Anr. v. Union of India & Anr. [(2011) 4 SCC 1]. It was the claim of the petitioners that the representations, complaints and inputs advanced by inter alia noted lawyers Ram Jethmalani and Prashant Bhushan and BJP leader Subramanian Swamy against the proposed appointments were not duly considered. What was submitted against Mr. Chaudhary was that he had met Mr. Sinha in December, 2013 and April, 2014 at the latter’s official residence. When the meetings were held, the former was probing the interception dealings of Hawala dealer Mr. Moin Qureshi, while Mr. Sinha was investigating the Stock Guru scam where senior income tax officers were involved and Mr. Chaudhary’s role was being investigated. Certain senior income tax officers had taken a bribe to favour two scamsters of Stock Guru and had misappropriated about Rs.40 crores. The Said officers were working under Mr. Chaudhary. Eventually, while the Income tax department gave a clean chit to Mr. Sinha in respect of Mr. Qureshi, the CBI gave a clean chit to Mr. Chaudhary. The bench noted that in June, 2013, the CBI had started an investigation into the conduct of the then Investigating Officer of the Stock Guru scam, that is Mr. Yogender Mittal. Mr. Chaudhary’s name did not figure in the FIR filed by the CBI; No wrongdoing, no shortcoming on his part was found by any authority (the CVC, the Department of Revenue and the Department of CBDT) when 13 allegations were levelled by one Mr. Anil Kumar Agarwal. The CBI had investigated the relevant case during the tenure of Mr. Sinha on the basis of a complaint received from the Economic Offences Wing of the Delhi Police, relating to demand and acceptance of illegal gratification from M/s. Stock Guru by Mr. Mittal to help him in the income­-tax case. The investigation did not reveal the involvement of Mr. Chaudhary. It was urged by the counsel for the petitioners that Mr. Chaudhary had abused his position as member (investigation) in the CBDT to under­assess the income of the said company in February, 2012, that He had issued a direction to the assessing officer to dispose of the case in a particular manner which could not have been done in view of section 119 of the Income Tax Act and the judgment of this Court. The CBDT had no jurisdiction to instruct the assessing officer to dispose of a case in a particular manner. The bench noted that In a meeting held on March 22, 2014, the DCIT (Assessing Officer), the Additional Commissioner and Chief Commissioner had apprised Mr. Chaudhary that they were of the view that no addition of Rs.234 crores was warranted as there was no evidence to suggest, much less to approve, that an accounted sale to that extent took place in the span of 21 days in September, 2011. Mr. Chaudhary had only agreed with the conclusion of the aforesaid officers and not taken any decision. The bench considered that when Mr. Chaudhary had taken over as DGIT (Investigation) in November, 2010, the surveillance of Ms. Nira Radia was over and some intercepts relating to such surveillance had leaked into public domain. The issues had been identified and necessary action was being taken either by the Delhi Directorate or was communicated to the Directorates for further action. The information was duly shared with the Assessing Officers and other law enforcing agencies such as CBI, ED etc. The matter was before the apex Court in a PIL. None of the authorities had ever found any shortcoming or inaction on his part on this count. It has been observed that during his tenure from November, 2010 to August, 2012, he had investigated the case of Unitech Ltd., whose associates and their sister concerns had been granted licences, as well the cases of few other telecom companies. The findings were communicated in due time to the Assessing Officer who took appropriate action. In respect of matters of other telecom companies under the jurisdiction of the DGIT, Bombay, Chennai, Bengaluru etc., Mr. Chaudhary, as a nodal agency coordinated and made several representations as to the action taken by the income­ tax department before a Joint Parliamentary Committee. It could not be pointed out in which particular matter Mr. Chaudhary was found lacking. 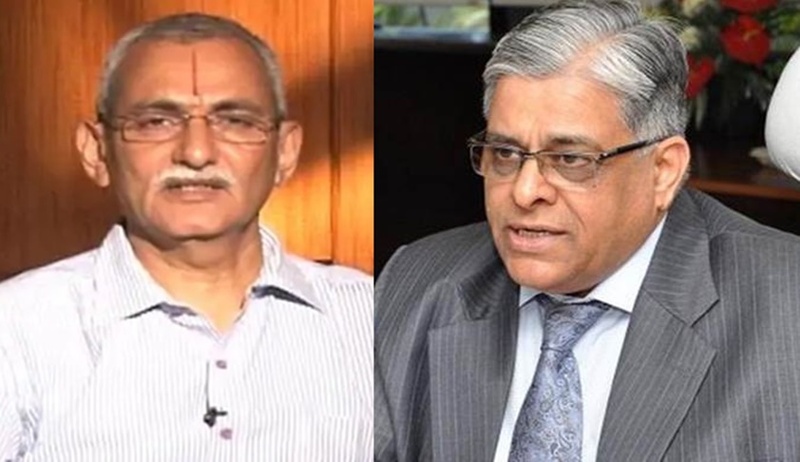 Questioning Mr. Bhasin’s credentials, the petitioners alleged that the CVC had in 2013 indicted him, when he was serving as CMD of Indian Bank, for forging and tampering with the appraisal report of the then general manager of the bank.